Profiles of musicians who are not rock stars. I interview them at their day jobs, hone in on an interesting story, mix in found sounds from those jobs, mix in music. In the end, you get an intimate portrait of a musician you might encounter while running errands in your neighborhood. Seattle's Matt Watson performs as a rapper and producer under the name Spekulation. He used to hate his day job serving espresso. After being outed as the cynical blogger behind "The Bitter Barista," Matt thought he'd never make espresso again. But then he found a tiny coffee shop at the center of Beacon's Hill's music scene. Part of a series of profiles of musicians at their day jobs. Because not everybody gets to be a rock star. 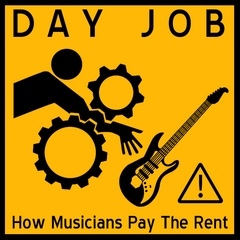 Free to radio stations and podcasts so long as you direct listeners to dayjobmusic.org for more Day Job episodes. Kennith Darling played bass with Seattle band The Trouble Starts. That is, he used to, until the band broke up. "I feel like I lost three really close friends," he said. But Kennith had a restaurant to manage, and the biggest night of the year was fast approaching. There's nothing to take your mind off personal problems like selling pies to math nerds on Pi Day. Lesli Wood has achieved almost every goal she's set for herself. She's a professional lawyer. And her band, The Redwood Plan, has played to big crowds at Seattle's Bumbershoot Festival. She chalks it all up to a "ruthless" work ethic and good planning. But there's something in Lesli's life that didn't fit into her plans. A diagnosis of multiple sclerosis. And it's caused her to redefine what it means to succeed in music and in her day job. Free to radio stations and podcasts so long as you direct listeners to http://www.northwester.org/dayjob/ for more Day Job episodes.